Dental extraction is reported to trigger recurrent herpes labialis (RHL). This aims to prospectively study the clinical occurrence of RHL and the oral herpes simplex virus type 1 (HSV-1) viral shedding before and 3 days after different dental procedures. 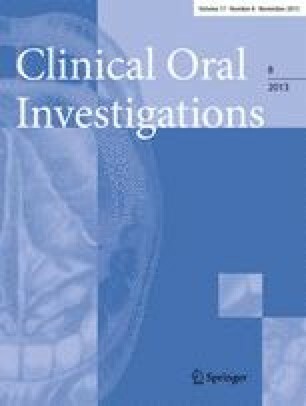 Oral HSV-1 DNA was measured by real-time PCR before and 3 days after dental procedures of the inferior dentition in 57 immunocompetent patients (mean age 32.4 years) who were selected and divided into four distinct subgroups (dental inspection without anesthesia, n = 19; dental filling under local anesthesia, n = 14; molar extraction under local anesthesia, n = 15; and molar extraction under general anesthesia, n = 9) and compared to 32 healthy controls (mean age 33 years). None of the patients suffered from RHL at day 3. Oral HSV-1 DNA was detected before and after procedure in 1.7 % (1/57) and 5.3 % (3/57), respectively [dental inspection without anesthesia, 5.3 % (1/19); molar extraction under local anesthesia, 6.7 % (1/15); and molar extraction under general anesthesia, 11 % (1/9)]. None of the controls presented RHL or detectable oral HSV-1 DNA. There was no statistically significant difference between the study groups and controls. Molar extraction increases the risk of oral HSV-1 shedding but not of RHL. Procedure-related nerve damage probably accounts for HSV reactivation. Antiviral prophylaxis for RHL is not routinely recommended for dental procedures, regardless of a prior history of RHL.